Yesterday I introduced the two key requirements I love in a good crust: oven spring and steam. Jim Lahey states he has solved this problem by cooking the bread in a preheated Dutch oven. Today I detail my experience with that suggestion. Until I tried Jim Lahey’s recipe, in his "My Bread: The Revolutionary No-Work, No-Knead Method", I thought it very difficult to recreate a great crust within the limitations of one’s home oven. Not only does his method of “an oven within an oven - the potâ€ give you the necessary oven spring and steam for a great crust on your loaf of bread, but also, you don’t have to knead the dough. I found the whole experience easy, delicious and totally accessible. And the process is so user friendly that even I, a balker of measuring, look forward to following his simple recipe. The air released when I removed the plastic after the 18 hours of fermentation flooded my senses with the sweet sour tang of fermentation. Bubbles on the top of the dough were mute evidence of the feeding bacteria - digesting sugars and starches in the grain. I have done the recipe twice using flours of a different protein level. The classic loaf I followed Lahey’s advice and used bread flour from Westwind Milling Company. Westwind Bread flour has a protein content of 14 percent, which creates a tougher “gluten balloon,â€ or gluten structure. 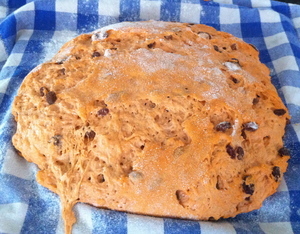 For the carrot loaf (where I substituted carrot juice for water and added Â¾ cup of raisins), I used all-purpose flour from 365. All-purpose flour has a protein content anywhere from 9 percent to 12 percent. My bag is labeled at 12 percent. The higher the protein the stronger the “gluten balloon.â€ Lahey says he has success with any flour over 11.5 percent protein. I experienced more loft and expansion with the all-purpose flour, almost too much, for the second rise; a lot of the CO2 bubbles were popped when I went to transfer the dough into the hot Dutch oven. But I did not feel that 14 percent bread flour rose enough. My next step is to mix the two for a 13 percent protein level and see what kind of “gluten balloonsâ€ form. 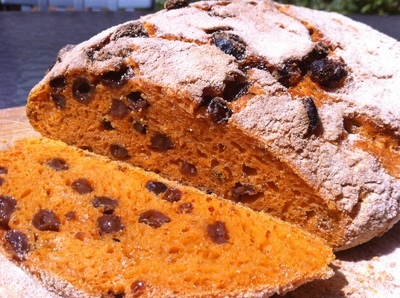 A very fun discovery was the intense color, the sweet aroma, and the moisture of the carrot bread. As the harvest bounty continues at the farmers markets, I might try making beet juice bread next.